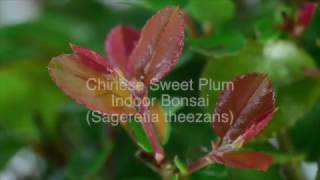 An incredibly beautiful Sweet Plum indoor bonsai with accentuated curves and wonderful russet foliage. The glazed cream pot & drip tray gives a great natural finish to this delightful bonsai. Great for beginners and comes with free care instructions. The lovely open structure so one can appreciate the incredible trunk flow. The nebari (the start of the trunk) is superb - exposed roots and gnarly twists with flaking bark add to the character and appeal. A fast growing variety which symbolises new beginnings and warm wishes; thus making a beautiful bonsai as a gift idea. Please select the most appropriate delivery date on the calendar at the checkout. Free delivery is available. This bonsai has the most beautiful trunk with wonderfully accentuated curves and styling. With a beautiful canopy this charming bonsai really is most artisitic and beautiful. Ideal for beginners, it is easy to care for. Wonderful small purple fruits as it matures and new foliage tips flecked with russet tones. I love this bonsai tree. * Pot size (cm): Natural cream rectaungular ceramic bonsai pot.